The two builds this summer will be slightly challenging because, while they will both be small jumbo guitars, using the same molds, one will be a 12-fret design using a 25.5″ scale (customer specs), while the other will be a 14-fret design using a 24.75″ scale (my preference). Btw, 12- and 14- fret refers to the fret where the neck joins the body. Before the 1930’s, most guitars were 12-frets, nowadays, most guitars are 14-frets, but there is a growing demand for the earlier design, especially among fingerstyle players. In addition to these design differences, the bracing patterns are different. In addition to moving the soundhole and changing the x-brace angles to accomodate the change in the bridge location for the 12-fret guitar, the custmer wants a symmetrical tonebar brace pattern similar to one used by Larrivee guitars, and similar to the one that I use in “The Beast”, illustrated in an earlier post. I will be using a typical asymmetrical lower tonebar design for my guitar. 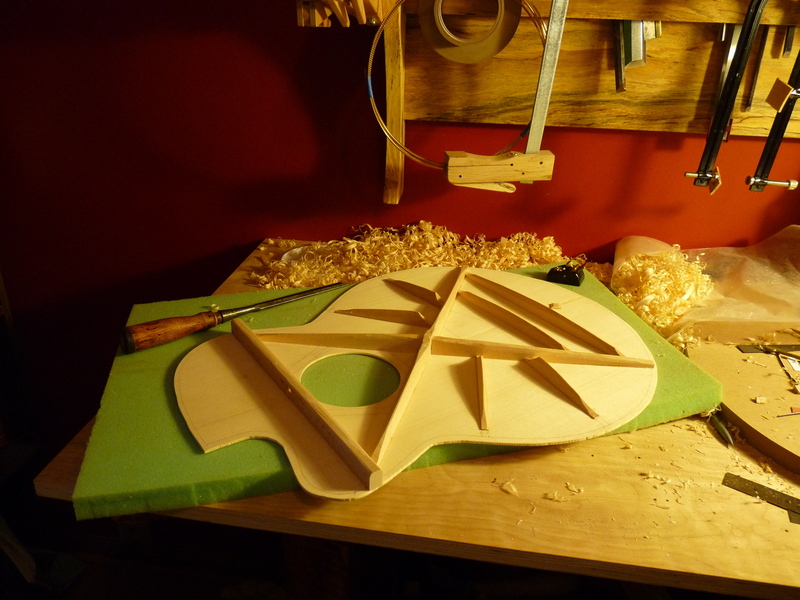 Both guitars will get a parabolic shape to the braces, rather than a scalloped shape. The braces are milled from well quartered sitka spruce stock, the bottoms are arched as needed, and each brace gets glued into place. After they have set, I carve the to reduce their mass, while leaving as much height as I can for maximum strength. My favorite tools for the job are my 1/2″ Stanley 720 paring chisel and a Chinese style ebony finger plane. The diamonds are added for a little extra seam support where there isn’t any brace. 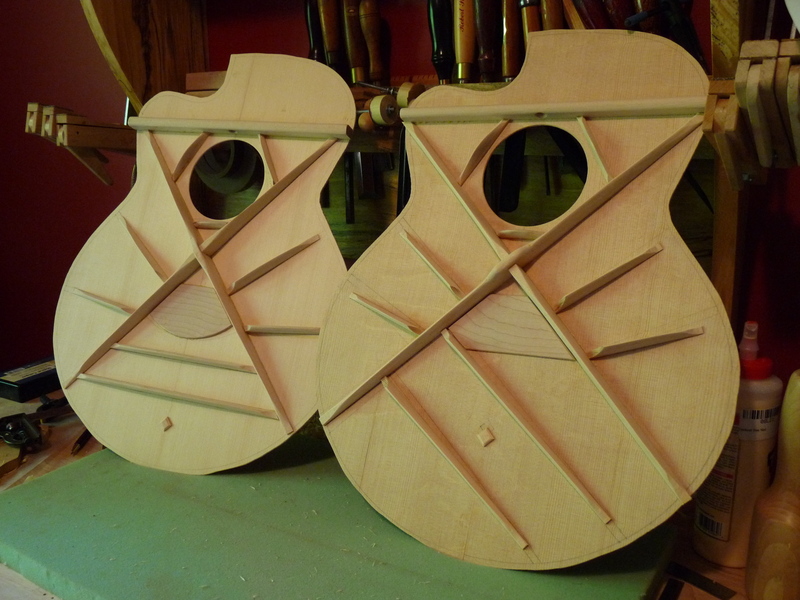 You can really see the different soundhole and bridge plate positions for the two different designs. This entry was posted on May 21, 2012 at 6:30 pm and is filed under Acorn House. You can follow any responses to this entry through the RSS 2.0 feed. You can leave a response, or trackback from your own site.